The Army West Point baseball team earned a thrilling 3-2 extra innings victory over Lehigh Sunday afternoon. 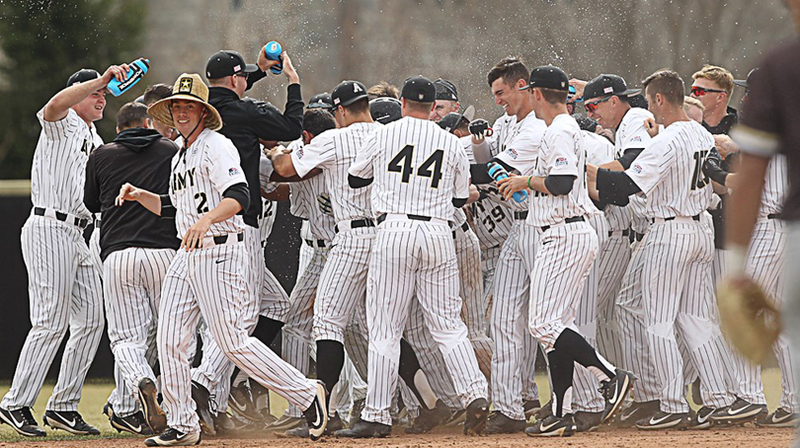 WEST POINT – The Army West Point baseball team earned a thrilling 3-2 extra innings victory over Lehigh Sunday afternoon. With the walk-off win, the Black Knights captured the weekend series, 2-1, after the two teams split Saturday’s doubleheader. Anfernee Crompton scored Army’s game-winning run after Carter Macias reached base thanks to a two-out fielding error. Blake Ledoux singled to kickoff the 11th inning before Crompton came in to pinch run for the sophomore. Drake Titus then shifted him to second on a sacrifice bunt before he touched home two batters later. Jacob Hurtubise, Tim Simoes and Ledoux each registered two hits in the game. John McKenna led all players with two runs batted in following his single in the third inning. Cam Opp was credited with the win after pitching 5.0 innings, allowing just three hits and two walks. The senior struck out five during his time on the hill as well. Army is now 2-0 in extra inning games this year. The Mountain Hawks broke the scoreless deadlock in the top of the third with a one-out solo home run to left field. Army wasted little time trailing as it put up two runs on three hits in the bottom half. Andre Walden and Hurtubise found themselves on second and third, respectively, with one out. McKenna then stepped into the batters box and delivered a two-RBI single up the middle to score both runs. Lehigh pulled even at 2-2 in the sixth when it sparked a one-out rally. The Mountain Hawks placed runners on first and second before Tony Gallo singled to right field to bring home one of those runs. Neither team was able to break the deadlock in the remaining three innings, forcing extras. Army finally broke through in the 11th for its 17th overall win and sixth Patriot League victory.